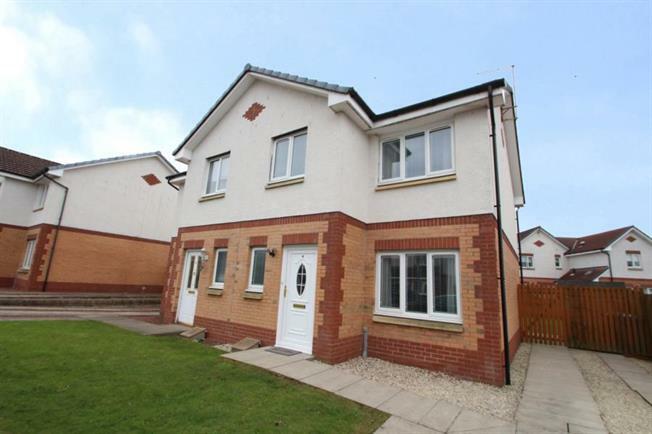 3 Bedroom Semi Detached House For Sale in Glasgow for Offers Over £170,000. Located within the highly sought after Parklands Estate and presented in walk-in condition , this spacious three bedroom semi detached villa will undoubtedly appeal to the family market. The standard of finish is evident on entering with neutral tones and quality focal point wall coverings it is sure to impress. Comprises , entrance hall with a two piece4 guest w.c.
front facing lounge ; well appointed modern style fitted dining sized kitchen with a good range of wall and floor standing storage units includes four ring gas burner and electric oven with patio door access to the gardens, three good sized bedrooms with fitted wardrobes and a well appointed three piece bathroom completes the accommodation. Modern benefits include gas heating and double glazing. Externally the home sits within and mainly south facing rear level garden grounds with feature patio, and off street parking is by way of a driveway to the side of the property. Parklands provides convenient access to nearby high street shopping at Silverburn with local shops, popular schooling and for the commuter nearby rail, bus and excellent motorway networks. Viewing highly recommended.